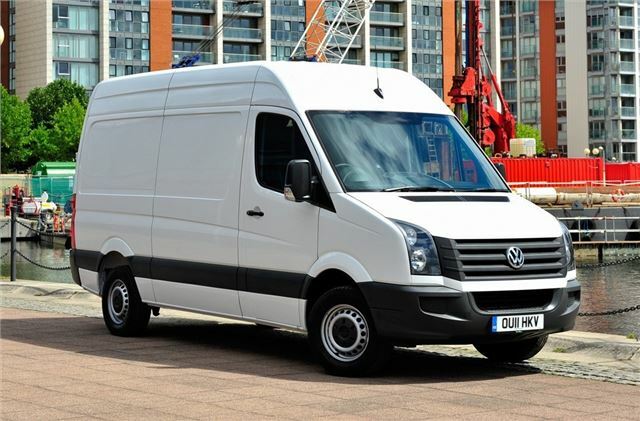 The new Volkswagen Crafter van goes on sale on the 1 August when the first vans arrive at Volkswagen Van Centres across the UK. The updated van is now even more economical with Volkswagen's latest 2.0-litre TDI engine capable of a claimed 38.7mpg with CO2 emissions of 199g/km. The common rail 2.0 TDI engine is already used in the Transporter and Amarok. It is available in various power outputs of 109PS, 136PS, 143PS and the top 163 PS, with BlueMotion Technology models offering further savings in fuel costs and emissions, yet delivering the same or higher levels of torque at lower engine speeds than the previous five-cylinder, 2.5-litre BlueTDI engine. So the new Crafter 2.0-litre TDI 163PS BlueMotion Technology, medium wheelbase panel van achieves 29 per cent better fuel economy on the combined cycle than the previous 2.5-litre BlueTDI engine with the same power output. This is the equivalent of up to eight miles further per gallon, which could add over 130 miles to the range of the 75 litre fuel tank. The new engine is also lighter, and this weight saving not only helps the improvements in fuel economy, but also increases payloads by up to 100 kg. Emissions have dropped by between 10 and nearly 20 per cent. The new Crafter no longer uses AdBlue to achieve these low (EuroV) emissions, yet still qualifies for EEV (Enhanced Environmentally friendly Vehicle) status as standard. The wide range of body types includes the standard large van, a window van, chassis cabs or conversions such as tippers, dropsides and a Luton body. The line up continues to offer three wheelbases, three roof heights, four body lengths and three gross vehicle weights of 3.0, 3.5 and 5.0 tonnes. Retail prices (excluding VAT) have only increased by an average of 1.2 per cent, or £320, starting from £20,450 for a CR30 2.0-litre TDI 109 PS, short wheelbase panel van or from £309 a month (plus VAT and initial rental) with the latest contract hire and finance lease offer from Volkswagen Commercial Vehicles Finance.